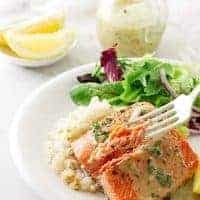 Prepare your tastebuds for the wonderful flavors of this Cedar-Plank Sockeye Salmon with Hazelnut Vinaigrette. The salmon fillets are moist, tender and every bite is infused with the sweet, smoky flavor of the cedar plank. Next, spoon the luxurious hazelnut vinaigrette over these fillets and you have a dinner fit for a King! The cedar plank is not a new method of cooking and here in the Pacific Northwest the natives have been roasting their salmon like this for eons. Cedar planks are relatively inexpensive and readily available at hardware stores, lumber yards or anywhere outdoor grilling supplies are sold. Cedar planks are dry and flammable wood so they need a good two-hour soaking to keep them from catching fire during the cooking process. After the soak the plank gets really hot in the oven and it begins to steam and releases that wonderful woodsy flavor of cedar that just permeates into the salmon. Why Soak the Salmon in a Salt-Water Solution? Our sockeye salmon fillets also get a little soaking. It is so disappointing to pull a gorgeous cut of salmon out of the oven and see white stuff in places. Yes, it is a natural process and it is called albumin but it can be eliminated or controlled. It is caused by protein in the flesh that is pushed out of the muscles during the cooking process. A short ten-minute soak in a salt-water brine is the secret to eliminating all or most it. 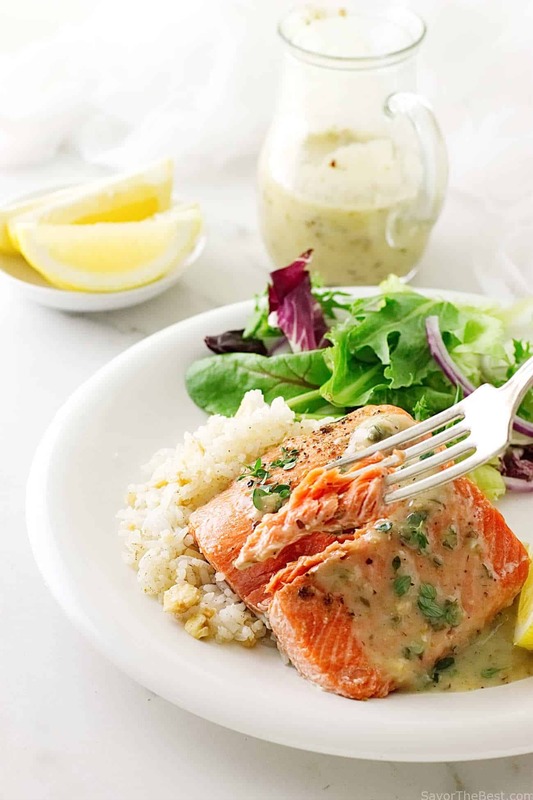 That briny soak will also firm up the salmon and make it more moist and flavorful. 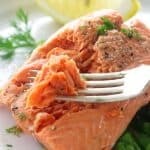 How Long Should a Salmon Fillet Cook? Calculate four minutes for each one-half inch of thickness. Try to purchase fillets that are at least one inch in thickness. Remove from the oven when it is firm and barely opaque all the way through or if using an instant-read thermometer to a temperature of 140 degrees. Hazelnuts are the star in this flavorful vinaigrette. Hazelnuts are products of the Filbert tree and have a dark colored skin that some people like to remove after roasting. However, we like the flavor that the roasted skin imparts to the nuts and our vinaigrette. The ground toasted hazelnuts add a unique flavor-burst that you will love when spooned over the salmon fillets. 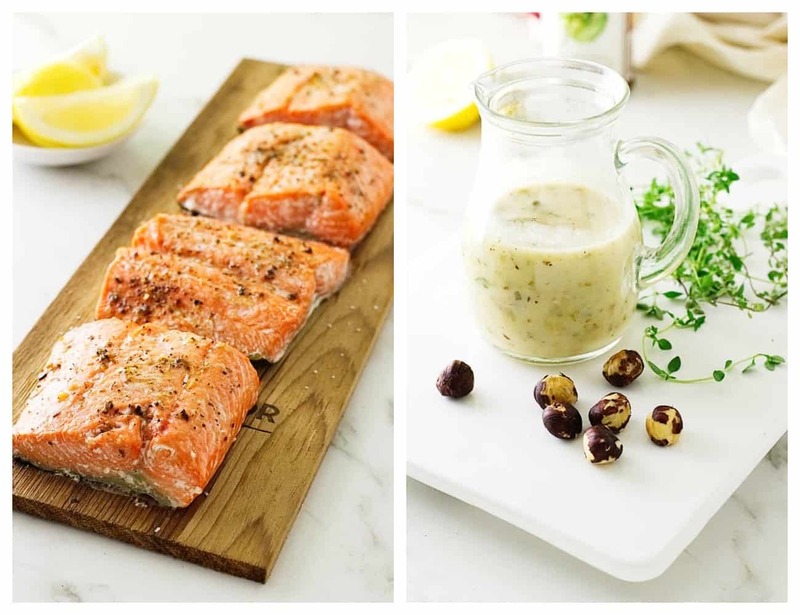 If you have not yet tried salmon roasted, baked or grilled on a cedar plank, you just do not know what you have been missing. It is really worth it! Into a food processor or blender, whirl the lemon juice, shallots, mustard and honey until smooth. With the motor running, slowly add the olive oil, processing until well combined, then transfer the mixture to a small bowl. Whisk in the hazelnuts and thyme leaves. Salt and pepper to taste. Place the cedar plank on a baking sheet and transfer to the oven to preheat for 15 minutes. 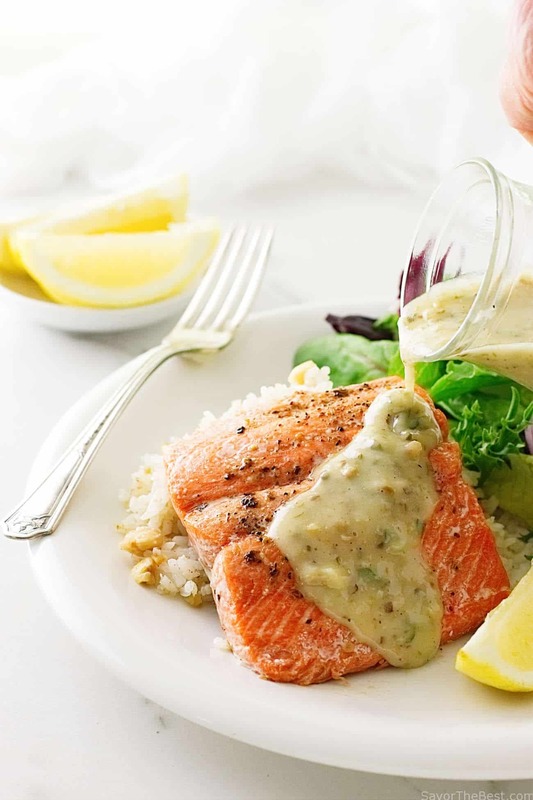 Place the salmon fillets in a casserole dish, in one layer, skin side down and pour the salt water brine over them. Allow them to soak for 10-minutes. After 10 minutes, remove the fillets to a plate and pat dry with paper towels. Reserve until the cedar plank is ready. After the salmon has cooked for about 8 minutes, check for doneness by cutting into the thickest part of the salmon. Remove from the oven when it is firm and barely opaque all the way through (about 140°), transfer to a serving plate, drizzle with the vinaigrette, garnish with fresh thyme leaves and serve immediately. To keep the cedar plank fully immersed, elevate it slightly by setting it on a can, such as tuna fish and place another object heavy enough to keep the plank weighted so it doesn’t float. We placed a jar of marinara sauce on the plank. 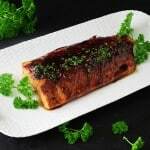 To determine how long to cook the salmon: Measuring at the thickest part, calculate 4 minutes for each one-half inch thickness. Try to purchase fillets of at least 1-inch thick. 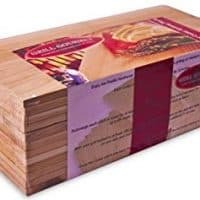 You can purchase cedar planks just about any place they sell BBQ grill equipment but you will pay about $8 for two planks of about 5”x12”. Or…. you can go to your local lumber yard and purchase untreated cedar siding board for about $10 and cut a bunch of them yourself. With proper care you should be able to reuse your plank several times before tossing it in the woodstove. Just scrub your plank with coarse salt, cold water and lemon juice. This will help to keep it smelling fresh. Do not use soap, as it will leave a trace of flavor. Ay, this looks so extremely tasty <3 Thanks a lot for sharing it with us. I love recipes like that, even though I eat them so rarely. I love salmon cooked any which way, but it’s always special on a cedar plank. Fun recipe! Thanks so much. Love salmon!!! This looks amazing!!! 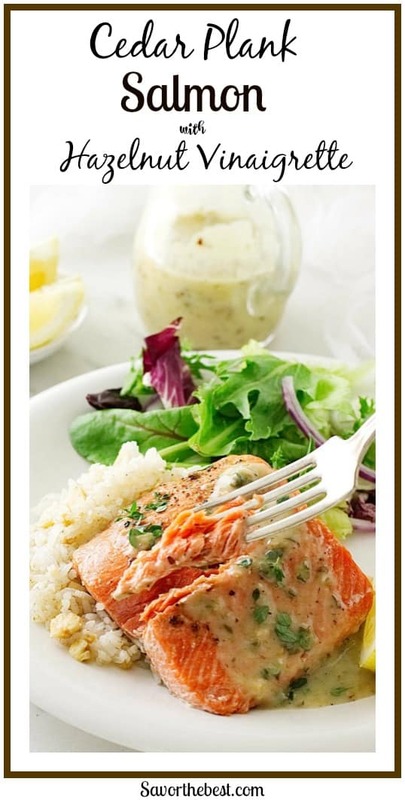 Very beautiful salmon recipe! 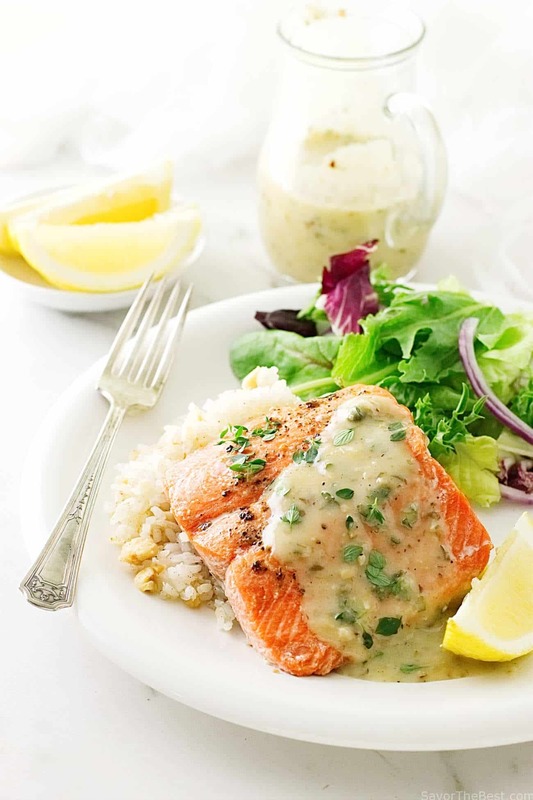 I love seafood, salmon is very healthy, my family always eat it twice a week. That hazelnut vinaigrette sounds amazing. 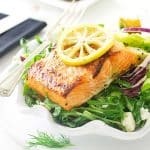 Usually my husband just does a lemon dressing on his salmon but I bet he’d LOVE this! I make a cedar planked salmon too and it’s one of our favorites. That sauce looks incredible. I want to lick the screen.